History trailed Simone Biles around the Aspire Dome all day Friday as the woman many call the greatest of all time added vault gold and uneven bars silver to what is shaping up to be her most successful World Championships yet in Doha, Qatar. History chased after her on vault, as Biles captured her first World title on an event where she had until now always been eclipsed by specialists on the world stage. Her 13th World title gives Biles the all-time record of world titles, surpassing Vitaly Scherbo of the USSR, who won 12 between 1991 and 1996. 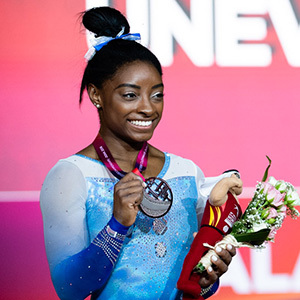 History swung with her on uneven bars, where Biles nailed a routine packed with difficulty, earning a silver on the event once considered her weakest apparatus. In doing so, Biles also becomes the only American woman to have medaled at a World Championships on all four individual events. The four-time Olympic gold medalist didn’t even need to do her full difficulty on vault to capture the gold medal on an event where she has long set the standard. After sitting down her newest innovation, The Vault That Will Be Known As Biles, in Thursday’s all-around final, the 21-year-old and coach Laurent Landi made the decision to go with an easier Cheng vault for Friday’s final. Even if it wasn’t her Olympic best, it was better than anyone else, and her second vault, an Amanar as terrific as ever, sealed the deal. On uneven bars, the only event where kidney-stone plagued Biles has produced error-free performances all week, she hit another clean set to for silver ahead of a field packed with specialists, including London and Rio Olympic champion Aliia Mustafina, who finished fifth, and two-time Olympic finalist Elisabeth Seitz, who took bronze, the first World medal of her career. With the gold, Nina Derwael kept her own rendez-vous with history as the first gymnast from Belgium to win a World title. Biles’s medals were the only ones captured by U.S. team members on a day where history was making its presence felt on nearly every event. Canada’s Shallon Olsen captured Canada’s first World medal on vault with silver, while Mexico’s Alexa Moreno became the first female gymnast from her country to win a medal of any color with bronze. Additionally, with bronzes on floor and pommel horse, respectively, Carlos Yulo of the Philippines and Lee Chih-Kai of Chinese Taipei won their country’s first-ever World medals in gymnastics. Competing in the first of her two event finals, 2017 World all-around champion Morgan Hurd finished sixth on uneven bars after a step on her full twisting double back dismount capped what was otherwise a flawless-looking exercise. “I think I did one of my better routines minus the dismount, and I’m just happy to be here in the bars final,” Hurd said, noting that she checked the “rage” she felt after mistakes on balance beam in Thursday’s all-around final to swing a quality set. Rebounding from the disappointment of finishing out of the medals in the men’s all-around final, Sam Mikulak cheered himself up with a fourth-place finish on pommel horse and seventh place on floor, both for hit routines. Xiao Ruoteng of China, the 2017 all-around champion who finished with silver this year, was golden again on pommel horse after a tiebreak based on execution score elevated him over Olympic champion Max Whitlock of Great Britain. After delaying shoulder surgery to compete in Doha, Greece’s Eleftherios Petrounias, the reigning Olympic and World champion on still rings, took his third consecutive World title on his specialty. New men’s World all-around champion Artur Daloloyan of Russia also earned the title on floor. All that and there’s still a day of event finals to come. The last woman to medal in every event at a World Championships was Soviet Yelena Shushunova in 1987, 10 years before Biles was born. Kidney stone aside, if Biles competes on beam and floor the way she has been all week, history will be calling her name again Saturday.